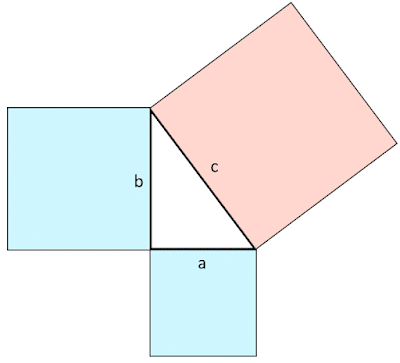 Chances are you’ve heard this described as Pythagoras’ theorem or the Pythagorean theorem. Mathematicians are perfectly well aware that it’s a misnomer: Pythagoras didn’t prove it, and he didn’t discover it either. We can be fairly confident that he was aware of the special case of the (3, 4, 5) triangle, which is the one illustrated above: a right-angled triangle with sides a = 3, b = 4 will have a hypotenuse (diagonal) of length c = 5 (3² + 4² = 5²). Pythagoras may or may not have been aware that the general case is true. But he certainly wasn’t responsible for proving it. Alas, we are stuck with the name. It’s probably not going away. How did his name ever get attached to the equation? Well, it’s thanks to two pieces of ancient testimony. The earliest extant general proof of the theorem is nearly 300 years after Pythagoras, in Euclid’s Elements, book 1 proposition 47 (ca. 300 BCE). Euclid gives a perfectly satisfactory proof. But he doesn’t mention Pythagoras: for that link, we have to wait until more than half a millennium later. In the 200s CE, Diogenes Laertius claims that Pythagoras discovered it. Diogenes is not a reliable source, but we find corroboration in a much more reliable writer, the famous Neoplatonist philosopher Proclus: writing ca. 450 CE, he assigns the theorem to Pythagoras in his landmark commentary on Elements book 1. One might conjecture that the Egyptians hold in high honour the most beautiful of the triangles, since they liken the nature of the Universe most closely to it ... This triangle has its upright of three units, its base of four, and its hypotenuse of five, whose square is equal to that of the other two sides. The upright, therefore, may be likened to the male, the base to the female, and the hypotenuse to the child of both, and so Osiris may be regarded as the origin, Isis as the recipient, and Horus as perfected result. Three is the first triangular odd number: four is a square whose side is the even number two; but five is in some ways like to its father, and in some ways like to its mother, being made up of three and two. And panta (all) is a derivative of pente (five), and they speak of counting as ‘numbering by fives’. Five makes a square of itself, as many as the letters of the Egyptian alphabet, and as many as the years of the life of Apis. This isn’t mathematics, it’s numerology and wordplay. Worse still, ‘the Egyptians’ is a spurious reference: we know of no Egyptian interest in right-angled triangles. We do know that Pythagorean teachings like reincarnation were often spuriously traced back to faux Egyptian mysticism. Other allusions to the above set of allegories can be found in Aristotle and other writers, and those sources confirm that the allegories originate in Pythagoreanism, not in Egypt (see Burkert 1972: 32-4, 40, 429). So the attribution to Pythagoras originates with the Pythagorean cult’s investment in numerology, and its allegorical interpretation of the numbers 3, 4, and 5. The Pythagorean cult did have some rationalist offshoots, and their numerological interest extended to things that we would call mathematics, in the hands of intellecturals like Archytas of Tarentum. But evidence about Pythagoreanism in the early Roman era is heavily flavoured by the mysticism of the Neopythagorean movement, embodied by figures like Apollonius of Tyana. In that period, Pythagoras’ mystic interest in the (3, 4, 5) triple was reinterpreted as a more grandiose claim: that Pythagoras was responsible for discovering the general proof. Hence the late story that we find in Diogenes Laertius and Proclus. First, a technical term. 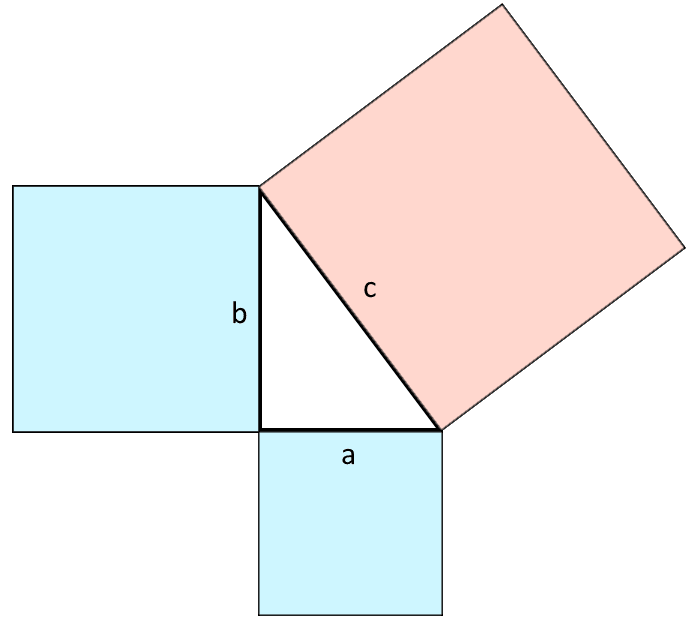 A Pythagorean triple is a solution to a² + b² = c² such that all of a, b, and c are whole numbers. As it happens, there are infinitely many Pythagorean triples, starting from (3, 4, 5), and going on to (5, 12, 13), (8, 15, 17), (7, 24, 25), (20, 21, 29), and so on. You can trivially generate an endless list of triples by multiplying one of these by a whole number: so (3, 4, 5) can become (6, 8, 10), (9, 12, 15), (12, 16, 20) and so on. But even if we exclude these and confine ourselves to triples that have no common factors, called ‘primitive’ triples, there are still infinitely many. 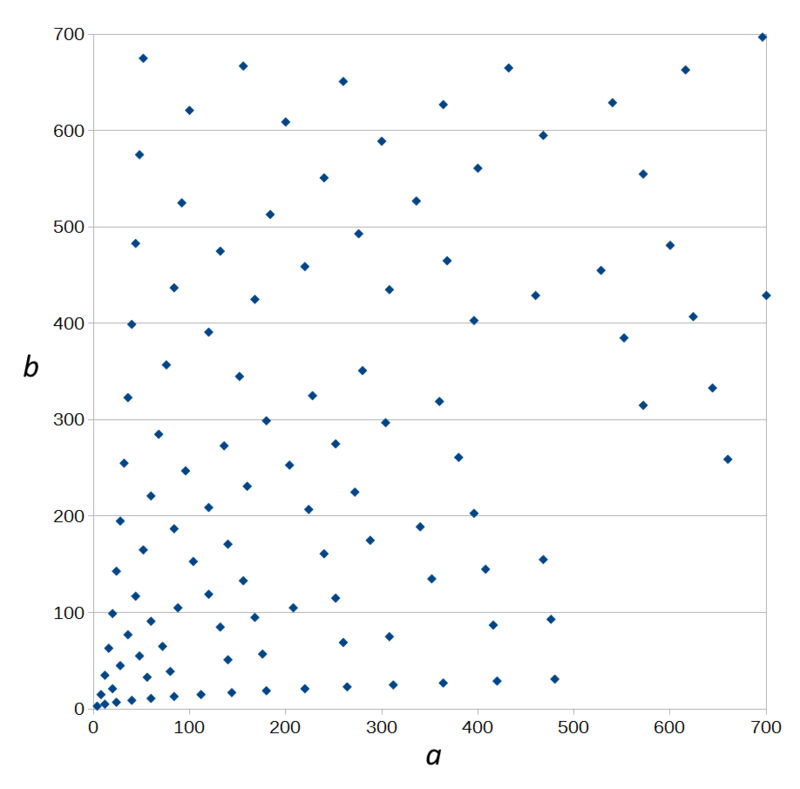 Just for c < 1000 there are 144 primitive triples. There are two main contenders for the honour of the earliest proof. Perhaps most famously -- or infamously -- the tablet Plimpton 322 can be interpreted as giving a table of fifteen Pythagorean triples. However, Elaine Robson (2001, 2002) has shown that this is a misinterpretation: the tablet is really a set of pedagogical exercises on calculating reciprocals. 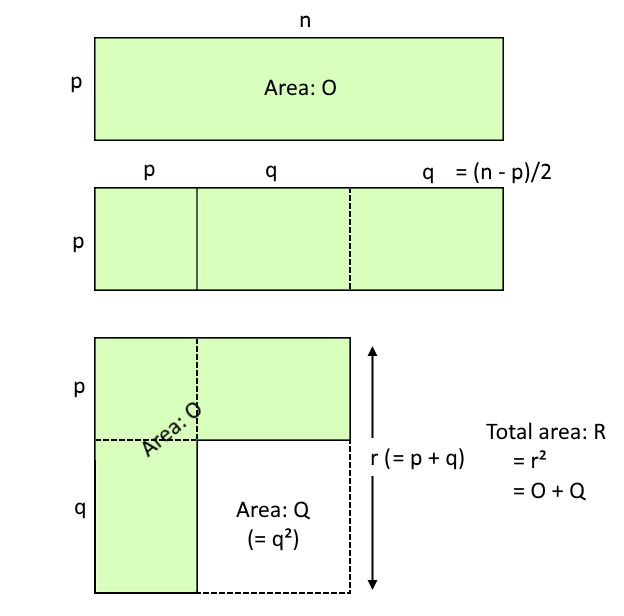 Even so, though the tablet is not premised on the idea of the Pythagorean equation, it still shows awareness of the equation: the table headings refer to the ‘square of the short side’ and ‘square of the diagonal’, implying right-angled triangles. So the Babylonians were well aware of the relationship between this technique and the Pythagorean equation. This diagram illustrates an Old Babylonian exercise on reciprocals, found in YBC 6967 (see Robson 2001: 183-4 for original phrasing), using a method that also underlies the table in Plimpton 322. Given two reciprocals n and p, and given that the difference between n and p is 7, what are the values of n and p? Note that in Babylonian notation, np = unity can be either 1 or 60, depending on context. The Babylonian procedure is geometrical, not algebraic. First mark off the difference, n - p, along the length of n and divide it in two: in this example, n - p = 2q = 7. Then cut-and-paste one of the smaller rectangles to produce the L-shaped figure in the third step. Calculate r = √(O + Q) numerically. The solutions are then n = r + q/2, p = r - q/2. Plimpton 322 gives figures based on this method. The four columns give values for: (1) R/O; (2) q; (3) r; and (4) line numbers. They are ordered in decreasing value of R/O. It is easy to mistake the second and third columns of Plimpton 322 for partial Pythagorean triples, since this method has the side-effect of generating the equation O + q² = r². As O = unity, it is automatically a square, so this has the same form as a² + b² = c². The exact same geometrical procedure appears in Euclid, Elements book 10, proposition 29, lemma 1, as a method for generating two squares whose sum is also a square. The only difference is that Euclid does not treat O as unity, and instead posits in advance that n and p are similar plane numbers, i.e. 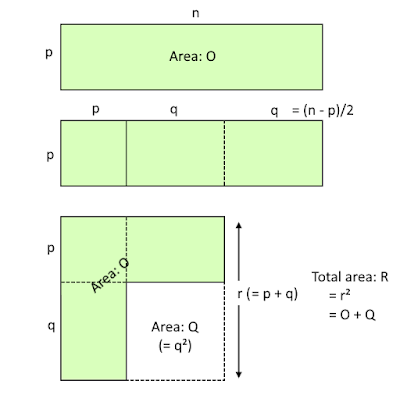 numbers whose prime factors form exact pairs, so that O = np is a square; and n and p have the same parity, so that n - p is even and q is an integer. As a result his equation has the form (√O)² + q² = r². (2) Euclid, Elements. The Old Babylonians may have been aware of the equation, but no proof of it survives from that era. We also find clear evidence that the equation was known in early India, in the Vedic Śulba sūtras -- but still no proof. In Han China, we find proofs for the specific cases of the (1, 1, √2) and (3, 4, 5) triangles; but no general proof for all right-angled triangles. When we listen to people who want to record events of the past, it is possible to find them attributing this theorem to Pythagoras, and calling him ‘ox-sacrificer’ for the discovery. I am impressed by those people who first understood the truth of this theorem, but I admire still more the Elements author: not only because he tied it fast [κατεδήσατο] through a crystal-clear proof, but also because he published a still more general one than this, in irrefutable scientific terms, in book 6. (The ‘still more general’ proof is book 6, proposition 31, which shows that the relationship holds for any similar rectangle on a, b, and c, not just squares.) Notice what he says? The proof is Euclid’s; only the discovery is attributed to Pythagoras. Though in reality, as we have seen, for Pythagoras the ‘discovery’ was numerology, not mathematics. How to decide between these two? Should we simply split the honour, crediting the Babylonians with the discovery, and Euclid with the earliest surviving proof? Any self-respecting historian should bridle at the notion that we have to view the past in terms of how we have benefited by it. And justly so. It’s not as though the only purpose of the Babylonians was to invent theorems for the benefit of the modern western world. Still, if we’re going to use this equation, it kinda makes sense to have a name for it. Splitting the honour seems reasonable to me. The equation is a Babylonian equation; the proof is Euclid’s proof. Either of them strikes me as better than giving Pythagoras credit for something that he neither discovered, nor popularised, nor proved. Fowler, D.; Robson, E. 1998. 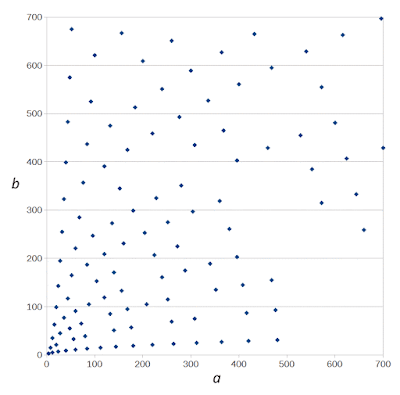 ‘Square root approximations in Old Babylonian mathematics: YBC 7289 in context.’ Historia Mathematica 25: 366-78. Robson, E. 2001. ‘Neither Sherlock Holmes nor Babylon: a reassessment of Plimpton 322.’ Historia Mathematica 28: 167-206. Robson, E. 2002. ‘Words and pictures: new light on Plimpton 322.’ American Mathematical Monthly 109: 105-20. Afterword. I’m glad I managed to sustain a fortnightly schedule for the first seven months of this blog. But it’s no longer realistic. I’ll have to be a bit more occasional from now on, I’m afraid. Particularly for a topic like this, the amount of reading and the difficulty of swotting up on Babylonian geometry is a tad excessive. I’ll try to be back at least every three weeks or so.